It's not unusual for many musicians to react on social media to the various terrorists attacks that have become the norm in recent times, but Monday night's Manchester attack has moved even more to post comments as it was an attack on both the music world and on young fans. Like everyone else my family and I were shocked to hear about the terrible news from Manchester. All that’s left to do is send heartfelt sympathy to the families of the victims and Ariana Grande. Praying that something like this never happens again. Love to everyone. I had a long night & was floating on wave of improvisational #bliss Then #manchester! Is this our world? My heart goes out to the people of Manchester and all of the UK. Manchester is one of the heart and soul cities of the UK, and having been there many, many times over the past 40+ years, I've gotten to know the city and the people there pretty well. I cannot pretend to know or even imagine the pain of the parents, brothers, sisters and other family members and friends of the innocent victims of this, these mostly young music fans having just enjoyed the concert. But I know that the people there will stand together and stay strong. Sadness today in Manchester…human lives lost and mangled…sadness indeed. Sending out healing thoughts. Many are just left numb by this news. My thoughts go out to the families and friends of those who lost loved ones at the Manchester gig, music should never be a target, it unites people. We were awakened late last night by a flurry of phone calls and messages from our loved ones at home to the news of the Manchester attack. As an entertainer, father, brother, husband, friend and a member of our global family...it is impossible to understand why anyone would desire to hurt innocent young concert goers this way and for that matter anywhere in the world. We must, as a global family, stand in solidarity against this cowardly act of evil. It doesn't matter your religious beliefs, color of your skin, or geographical location, overwhelmingly we desire to live in peace with the knowing that our children are safe! I am a 76-year-old man who has been blessed to travel the world. I can speak to the fact that the love we share for our family and friends no matter where we are from is a formidable common bond that unites us as a global world family to stand up against this seemingly pervasive evil plaguing our world. I am but one voice asking, begging everyone no matter where you are from to embrace every child who has died, or effected, as a result of evil as our own. Don't let one innocent life taken too soon go unanswered. Stand up for global unity against terrorism! We are terribly saddened and deeply sorry for the loss of loved ones and those injured. To our Manchester Brothers and Sisters, we stand with you, we grieve your loss, and we salute your bravery and overwhelming love and support of one another. I feel terrible about the news today. We knew this was going to eventually happen at a concert one day. My first reaction is we shouldn't give concerts because it is putting all the fans in danger, but that's what they want. If there's one thing I learned touring all these years, is that you carry on. That is the way you fight back. Today I feel sorrow and sadness, but tonight we will put on a great show in honor of those killed and injured. We will take every precaution, to keep our fans safe, to celebrate our freedom, and to strike back in the face of this terror. My thoughts are with the people of Manchester and particularly the victims and their families in the aftermath of the horrific attack on innocent concert goers. Scary to hear what happened in Manchester tonight. Love and Mercy to the victims. These terrible acts have to end. We are devastated over the tragedy in Manchester. Sending much love & sympathy to all the victims and their families. Friends , I am in Melbourne Australia, many miles away from the tragic events that happened in Manchester England today. The evil that happened, where innocent children were murdered by an ignorant , barbaric , & sinister cult. As humans we pray, as I believe that prayer and a conscious contact with a higher power is what the Humankind needs. I'm not talking about religion, all I'm asking is , for us all to join together, to be a Soul force. Terrorism will never win the battle, but if we do not stop it now we are heading for World War III. & that's what the evil enemy want . That ... love is the answer..
My heart goes out to all in Manchester. Too much tragedy in this tragedy. Love to Ariana Grande and her team. Manchester, I love you & my heart is with you, @arianagrande & all at @ManchesterArena tonight. There is nothing in any of the world's religious texts that supports or encourages or condones violence towards innocent people. What sort of hateful perversion leads anyone to think that God wants them to hurt innocents? Any religious leader who does not comprehensively and categorically condemn terrorism and terrorist violence is simply an enemy of God. Heading back on tour today. Obviously, after the tragic events in #Manchester, it's with a heavy heart and lots on my mind. I found myself searching for the right words to say to the thousands planning on attending our concert in Dallas tonight - who suddenly have to consider things of far greater concern than the inconveniences of parking their cars. My thoughts kept bringing me back to a dance I shared with this young lady in New Orleans, a few nights back. She must have been no more than 13, and attending the show with her mom. Perhaps, her first concert - just like so many of the fans in attendance in #Manchester last night. This moment/dance that I shared with her, and the thousands who witnessed it, was a moment of joy, energy, love, hope and freedom. That's what music is. It's what concerts are - a great expression of #hope and #freedom. Which is exactly why those with no #hope in their hearts, would choose to target them. It is also exactly why we must carry on, and continue our ritual of gathering to celebrate our lives, loves, dreams, hopes and freedom. Those lost and hopeless souls, who wish to spread misery and hatred, can only win by turning us into the same lost and hopeless souls that they are. They only win by killing our hope, and taking away our freedom. Tonight, I will dance. I will dance and sing and celebrate. It will be with a heavy heart, and with thoughts of the victims and families in #Manchester on my mind, but I will not be deterred. I hope that you won't be deterred either. I hope that young people everywhere, much like the young lady in this picture and the millions of #Arianators around the world, will continue to celebrate their freedom - and continue to find hope through music. We need #hope now more than ever, and our #freedom can only be sustained by honoring it - every day of our lives. The horror is indescribable. So many young souls. My heart is with those poor families who now have to live with the reality of their loss. More reason for more common understanding and human sympathy between people, less taking sides. 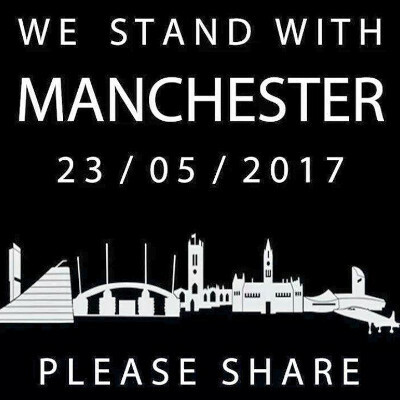 My thoughts and prayers are with all those affected by the tragedy in Manchester last night. Sending my prayers to all those affected in Manchester. I have many friends there. I plan on going back next year. 12 hours after the initial news came through from Manchester last night, the shock and numbness of it all is still as strong. Perhaps even more so this morning. Our profound sympathy goes out to all touched by this horrific event. In situations like this it is more than difficult to find appropriate words and actions. It all comes down to a feeling. And speaking as we did this morning, to all involved with Simple Minds. Including band, crew, management etc. the feeling in our group was entirely unanimous. More than ever, we all want to go out tonight and play our music. Feel really bad about Manchester. Happy concert goers slain and injured. So many families diminished and wounded tonight. No grievance or gripe or hard luck story justifies such premeditated hatefulness and outright indifference to another man's most precious possession: his own, or the life of the one's dearest to him. Tonight I take stock. Hold the ones I love close to me, and count my blessings. My heart is so heavy and along with the rest of the innocent world I've cried many tears. My condolences go out to the friends and family who have lost their loved ones to this mindless atrocity. We in Manchester will not be beaten and not be frightened. We will fight this cowardice with our hearts. Much love. I know Manchester stands together . We stand with you. "Our prayers are going up, tonight, for all the victims, of this latest despicable act of heinous murder, in Manchester, UK. May Almighty God, receive the souls of those lost, bless and comfort the families of those killed, and all those wounded and terrified, by this act of pure evil, and may He, in His righteous might, cause those responsible, to be swiftly brought to justice.....one way or the other. May God help us. "Collin". I'm speechless! Saying prayers for all those affected by the Manchester UK tragedy. Terrorists hate god as much as god hates terrorists! We are all from Manchester today! Let's make more music, concerts and noise as acts of resistance. I am deeply saddened by the tragedy in England. My thoughts and prayers are with all of you Manchester… Praying that the King of comfort will overwhelm you this day and in the days ahead. Our hearts go out to Manchester today, the news is absolutely devastating. Shocked and saddened to hear about Manchester. We know people working on that show, and along with what happened at The Bataclan, it’s all starting to feel very close. Hearing on the news about two bombs that went off in the Manchester Arena at the conclusion of a concert. Our thoughts and Prayers are with special friends ... that they and their families are safe tonight. Prayers to all in the UK, to those families that may have lost loved ones and to those who have been injured. You are all in our Prayers.